The anticipation of being at the game in a new ballpark was like nothing I’ve ever experienced and Great American Ballpark delivered. I still get chills when thinking about former President George H.W. Bush throwing out the first pitch and the sea of American flags being waved in the stands. Unfortunately the game wasn’t as memorable. The Reds fell to the lowly Pirates 10-1. Trailing 6-3 entering the bottom of the ninth, Ramon Hernandez’s third career walk-off home run capped the Reds four-run rally and gave Cincinnati its first Opening Day win since 2007. Unfortunately, the fast start would be bitter sweet as the Brewers would go on to the win NL Central. Newcomer Joe Randa broke a 6-6 tie in the bottom of the ninth by hitting the first-ever walk-off homerun in Reds’ Opening Day history. Adam Dunn hit a pair of homers, including the game-tying homer to set up Randa for the big heroics. The game only got seven pitches before home plate umpire John McSherry collapsed and died from a heart attack. The game got postponed until the following day. 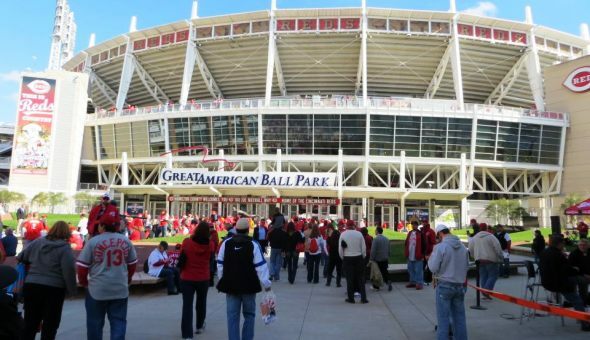 It was easily the most disturbing Opening Day experience in Reds’ history. To this day the umpire’s dressing room at the ballpark is named after the former umpire. 2000 – Debut of Ken Griffey Jr.
Coming of a magical 1999 season, the city was electric when one of the game’s brightest stars returned to his hometown. Much like Griffey’s tenure with the team, the day would disappoint. Cold rain would eventually cause the game versus the Brewers to be suspended at 3-3. Regardless of the outcome, it was easily the most optimistic I ever was to start a season. Many people forget that the lockout of 1990 forced the Reds to open up the season on the road. The team pulled out a tough win in Houston to start their wire-to-run to a World Championship.